Had a wonderful time at the MD/DE/WV SCBWI meeting on Saturday! This was the first time in a very long time that I did NOT bring a manuscript for critique. It made for a very low-pressure experience. I did some critiquing of my own, though, and read some wonderful manuscripts from some up-and-coming writers. I also volunteered at the registration desk, which was fun. And mortifying at one point, as I spilled a cup of tea on the desk and the name tags. AGG! Fortunately, this is why conference name tags are usually encased in plastic, and the conference had officially started, so there weren’t many there. Still, I’m wondering if they’ll pass a “no food or drink at registration desk” rule because of this. I also had two people track me down to get copies of “Bronze Dragon Codex” signed. I found it very amusing that, in a conference that was at least 90% female-attended, the two people who tracked me down to get BDC signed were male. I signed and stamped them (we have an R.D. Henham stamp) and thanked them for buying the book. 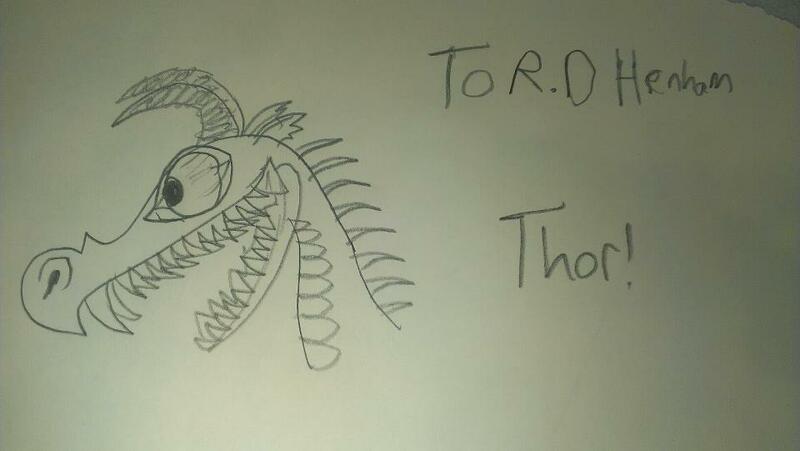 Then a few minutes later one of them came back and gave me this wonderful drawing! I need to start an area in my office for these! First act in new office! Did I critique manuscripts for next week’s SCBWI? Did I tackle a long-unfinished sewing project? Did I begin to bring order to my chaotic work files. Um, no. 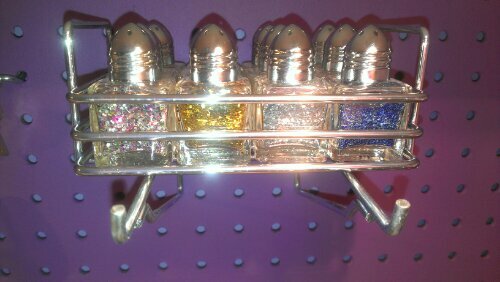 I filled itty-bitty salt shakers with glitter and hung them on the pegboard. And I almost never use glitter (one of the containers had a sticker from a store I haven’t visited since I was six years old). But hey, I’ve been waiting over a year to try this! Ahem. Well, it’s a start. I can’t officially move in until hubby fixes my computer’s wireless problems, but there’s a lot of other things to do. 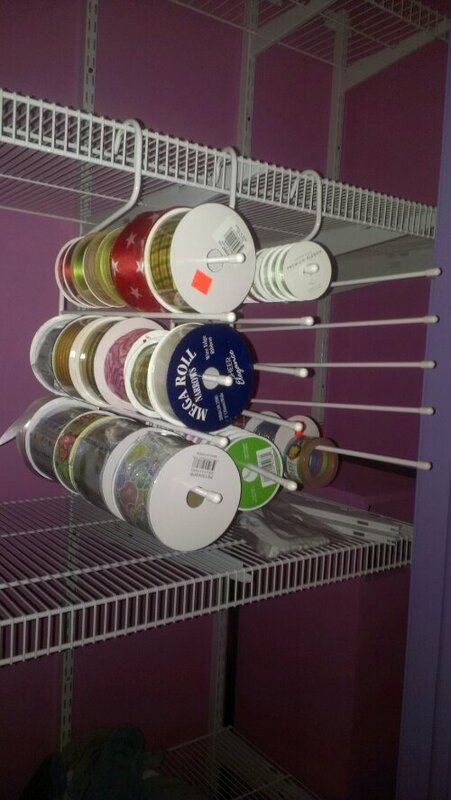 Like hanging spools of ribbon on pant hangers. 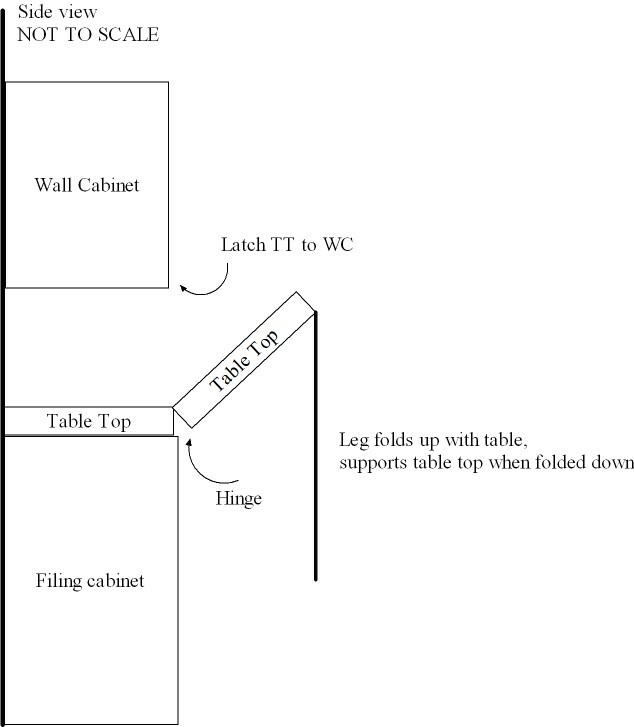 In this version I had a more detailed plan on where I was going to put file cabinets. I found some three-drawer ones for the left wall (those aren’t made by many people, but I found this set on Amazon that, each time I ordered one, came within two days, free shipping (not related to Amazon Prime, either!). I liked the height of putting a counter above a three drawer file cabinet; it was a good project height to either stand at or get a bar stool of some sort. For the lower (ie, standard desk height) countertop, I found these file cabinets, which have a bonus shallow third drawer on top. My old office had no small desk drawers for pencils, calculators, etc, so I really was glad I found these. I’ve been using them temporarily in the dining room as part of my temporary office and they’re wonderful! Don’t know if you can see or make sense of my notes on the left side of the picture, but that’s me calculating my new file drawer space (among other things, like determining what color file folders should be used for what categories). I had the equivalent of 8 file drawers in my old office. 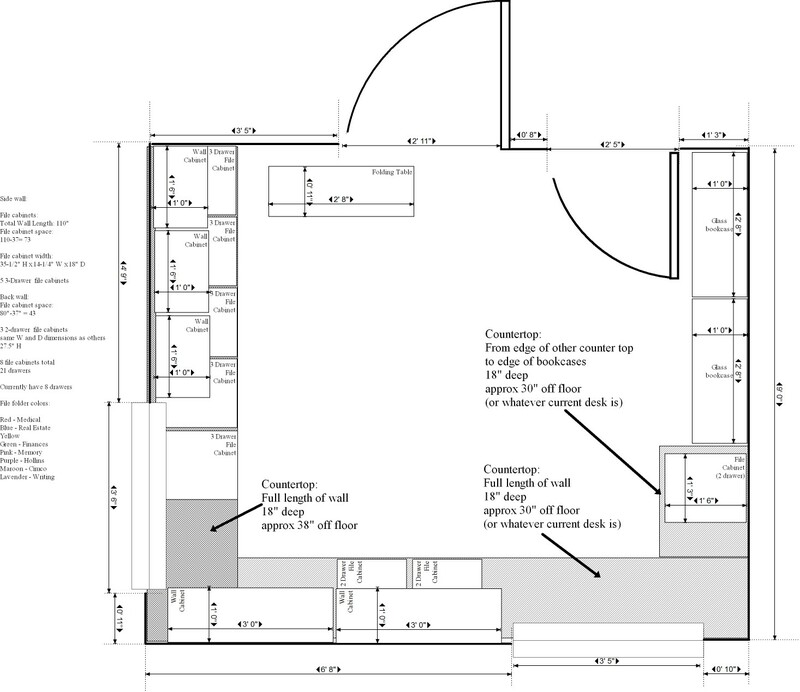 In the above floor plan, I planned for 5 3-drawer file cabinets and 3 2-drawer file cabinets, for a total of 21 drawers. YOWZA!!! 🙂 However, I ended up having to scale that back, because of how we needed to build the counter around the left window (and that gave me more sewing space anyway) and also realizing that I, um, need room for my legs under the table, so that’s shaping up to be 3 3-drawer and 2 2-drawer. That’s still 13 drawers, a 5 drawer increase, nothing to sneeze at! You’ll see this is pretty close to the original, with three major differences. One is there are two bookcases, rather than one. The reason for that was very simple. I already had two bookcases (with glass doors, so I can store my yarn and fabric in them and SEE what I have!) with glass doors and it just seemed odd not to use both of them. That cut down the counter space along the third wall, but, there was so much counter space as it was, I didn’t think I’d miss it. 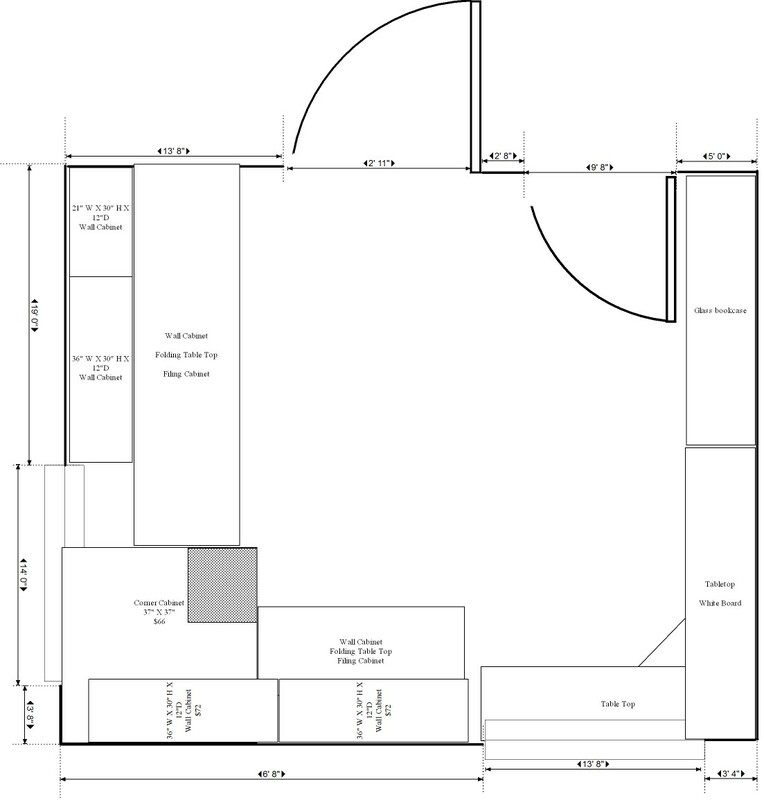 Two: I decided NOT to get a special corner cabinet for the lower left corner floor. I thought that would give me more space, but the more I thought about it, the more I liked having that as a dedicated sewing space. I also planned to buy file cabinets to fit under that countertop, and they would be easier to move around than a fixed cabinet. I did buy cabinets for the walls, the Ikea Akurum. I decided to go very plain (and cheap!) as possible since, thanks to Pinterest, I plan to modge-podge fabric or scrapbook paper onto all the wall cabinets and file cabinets. Neat idea, right? 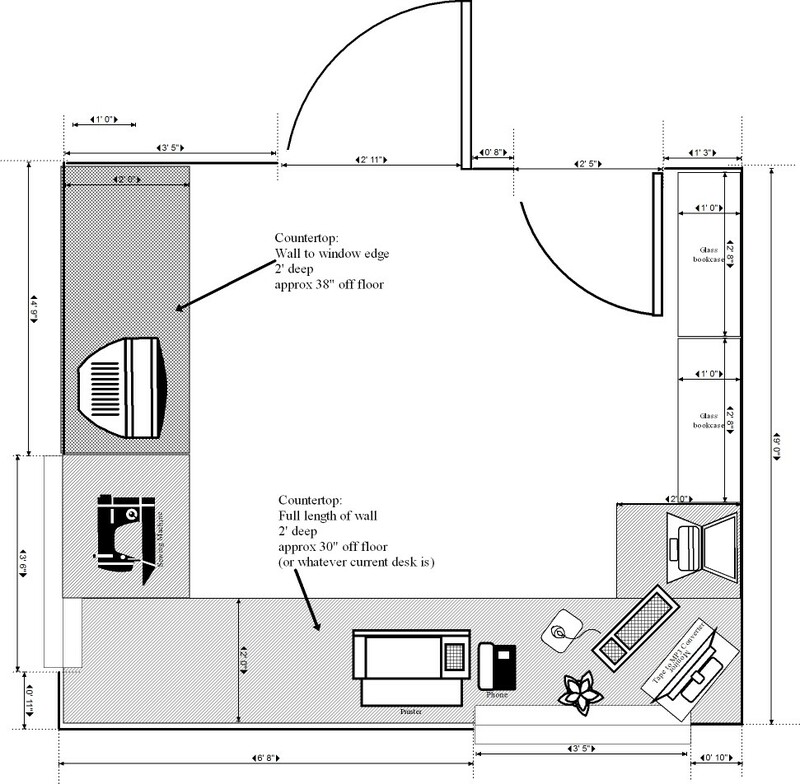 However, the more I thought about it and talked with hubby, it seemed to over-complicate things and would, when unfolded, eat up a lot of floor space in an already small office. So I sadly abandoned this idea. So far I’m not sorry, I’m very pleased with how things look now! Pictures next time, hopefully! I’m sure other writers use Wednesday for WIP posts, because there’s nothing writers like more than alliterative posts. However, I am taking this opportunity to pimp my cousin’s site, where she blogs about crafty works-in-progress, like quilts and dollhouses. Stop by if any of those things interest you. I thought that I’d post about the office work in progress, especially since, because of the snow, my husband is home so we’re actually getting some things done during the week (gasp!). However, I’m also putting the final touches on my current WIP, soon to be a WIP no longer but a finished project winging its way out into the world. I’ve submitted this work to many, many places, editors as well as agents. However, finishing it for the agent and giving her the go-ahead feels final in a way that it never did before. I find myself questioning things, like the name change. There’s other things that I’d thought about tweaking, but I’m forcing myself to stop after I finish the name change and make sure that there’s no scenes that address the old name. I let my critique group read the scene where I discuss the name change. I’m very glad I did, as they came up with some very good points. I cannot stress how important in-person critique groups are to me. I’ve tried online over the years, but I find them impersonal, even when I’m very good friends with the person who’s doing the critiquing. I like being able to bounce things around with my readers, and see what happens. I think of things when I’m sitting at a table with a few other writers discussing my words that I probably wouldn’t think of on my own. Ta ta for now. Next week I’ll probably resume office posts for WIPW, but for now, I must write!